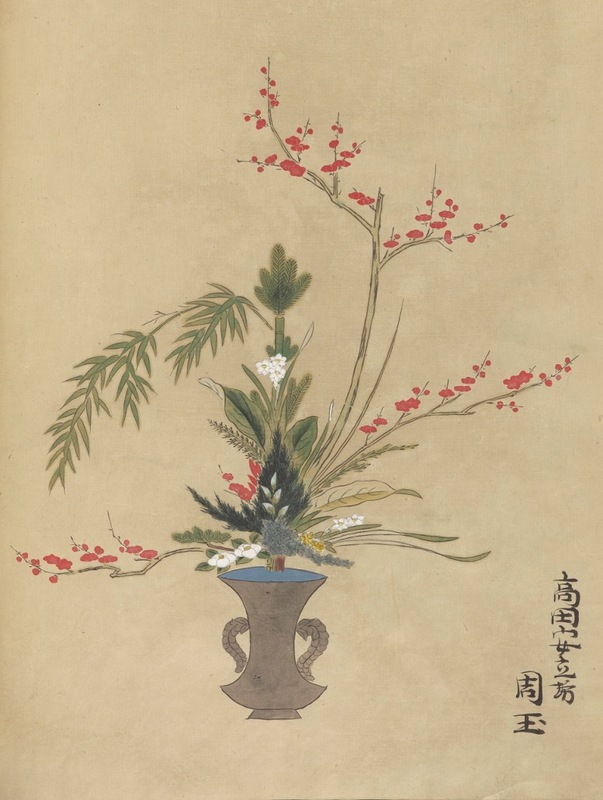 Rare early illustrations of the Japanese art of flower arrangement, now known as ikebana 生花, will be on display in the University Library Entrance Hall from 12 June to 1 July 2017. In Japan, ikebana has strong ties to poetry, religious traditions, courtly culture, and even traditional architecture. Early ikebana masters passed on the secrets of their art in manuscripts intended only for the eyes of their successors. One of the earliest extant examples of such a manuscript of secret transmission is the 1544 Yuishinken kadensho 唯心軒花伝書. The scroll, depicted at the head of this post, is the most recent major addition to the University Library’s excellent Japanese collections. It was purchased this year with the support of Art Fund and the Arts Council England/Victoria and Albert Museum Purchase Grant Fund. 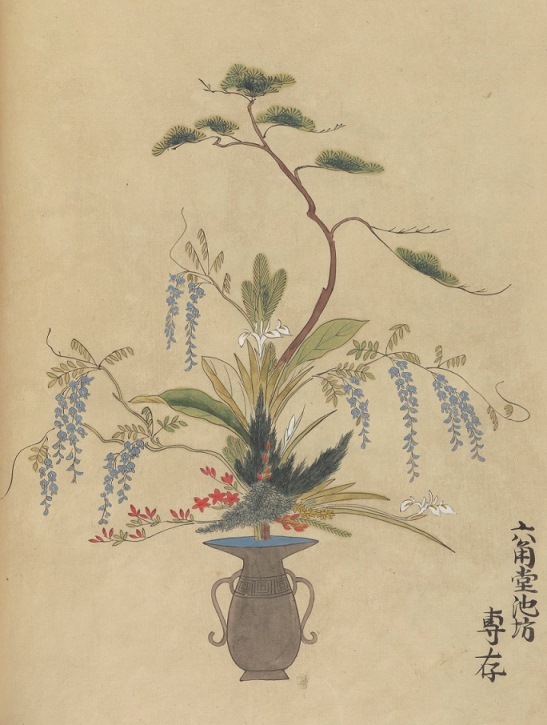 Also on display will be a seventeenth- or eighteenth-century manuscript album of full-colour flower paintings, Ikenobō rikka no zu 池坊立華図, as well as woodblock-printed books of ikebana from the Seizan 青山 and Mishō 未生 schools. Cambridge University Library possesses one of the largest and finest collections of early Japanese books in Europe. Professors Nozomu Hayashi and Peter Kornicki published a detailed catalogue of the Japanese collections in 1991: Early Japanese Books in Cambridge University Library: A Catalogue of the Aston, Satow and Von Siebold Collections. As the title suggests, many of the early books came from the collections of William George Aston (1841-1911), Sir Ernest Mason Satow (1843-1929), and Heinrich Baron von Siebold (1852-1908), all pioneers in the Western study of Japan. Aston, Satow, and Von Siebold travelled to Japan soon after the country established relations with the West in the latter half of the nineteenth century. They collected old and new books and manuscripts both for the books’ artistic merits and for their window into the country’s rich cultural heritage. Aston’s History of Japanese Literature and Satow’s Diplomat in Japan helped to bring this knowledge to a wider audience. The Japanese collections grew through both donations and purchases. Von Siebold’s step-daughter, Davida Carpenter, donated 721 Japanese books from his collection to Cambridge University Library in 1911. Later the same year, the library purchased much of Aston’s collection from his estate, and books Aston had previously acquired from Satow also entered the library at that time. Ikenobō rikka no zu, which will be on view in this exhibition, is among the books acquired in 1911 that belonged to both Satow and Aston. Subsequent gifts from Satow himself contributed to building the Cambridge Japanese collections. The collection attracted the interest of then Crown Prince Hirohito of Japan, when he visited England in 1921, and Hirohito donated hundreds of additional volumes from the Japanese imperial library. In 1937, the library acquired over two hundred volumes from the estate of Sir James Stewart Lockhart (1858-1937). Eric Ceadel (1921-1979), who served both as University Lecturer in Japanese and as University Librarian, established Japanese studies as an academic discipline in the university while also building the library’s modern Japanese collections and contributing to its Japanese rare books. Continuing in the tradition of scholarly engagement with the library, Dr Laurence Picken (1909-2007) donated his own collection of Japanese manuscripts related to traditional music in 1976. The acquisition of Yuishinken kadensho in 2017 marks a return to collecting Japanese rare books. With its digitisation, the scroll joins a growing Japanese digital collection accessible far beyond Cambridge. Yuishinken kadensho was purchased with the support of Art Fund and the Arts Council England/Victoria and Albert Museum Purchase Grant Fund. Wish I could see the ikebana exhibition, but unfortunately I am not in the UK. I would like to post it on Facebook for others to see. Can you post it on Facebook? Wonderful acquisitions! This is a gem of a display and worth going back more than once as more is revealed. Delightful!